The European Union is considering retaliatory tariffs against the US if President Donald Trump follows through on his plan to impose restrictions on the imports of steel. According to Shawn Donnan at the Financial Times, EU officials are considering tariffs on agricultural products including orange juice, whiskey, and dairy if Trump follows through with a steel tariff. The EU is not a large importer of steel from the US, so the measure focuses more on goods that the EU brings in from the US, according to the report. This is just the second move in what analysts fear could be a series of retaliatory actions leading to a slowing of international trade, which could have a serious drag on the US economy. Trump’s steel measure is designed to discourage Chinese steel dumping, but according to trade data it would likely impact allies like Japan, Germany, and Canada to a greater extent. According to a report from the International Trade Administration, China is not among the top 10 sources for US imported steel. 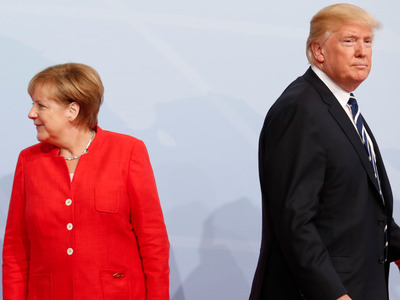 Officials from the EU and other ally countries are attempting to convince Trump to back off of his planned tariff during the G20 meeting in Germany this week. If Trump does follow through on the steel restrictions, according to the FT, an EU official said the retaliatory tariff would come soon after.